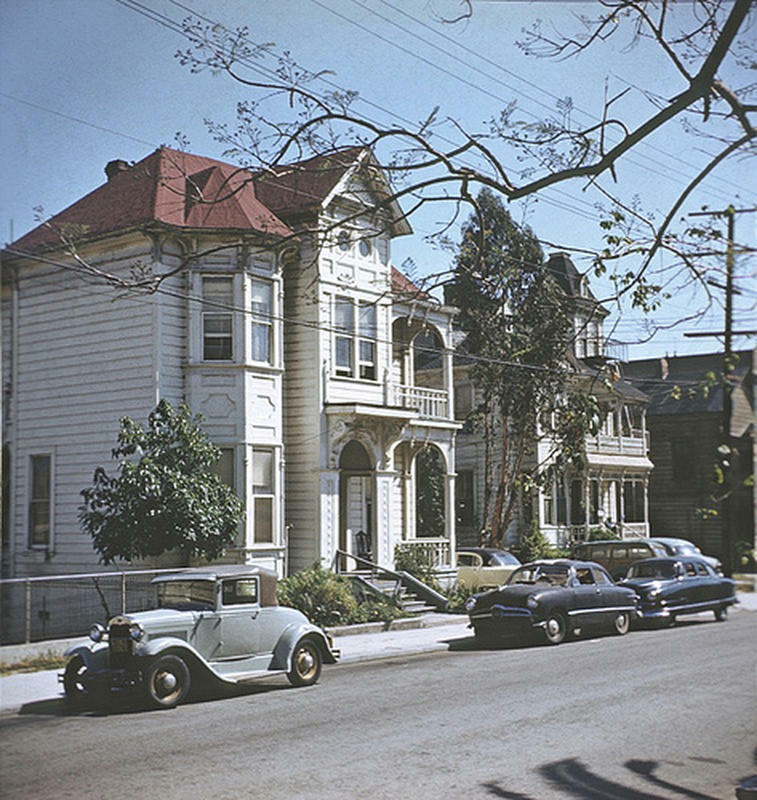 Despite its once fashionable apartment buildings attracting high-income residents, Bunker Hill had become a working class lodging district by the 1920s. 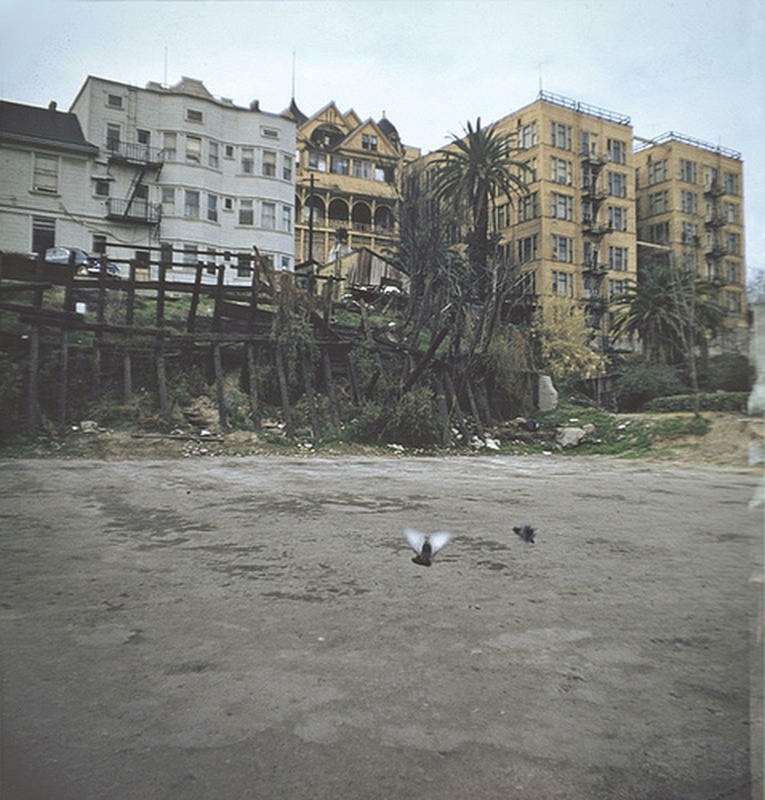 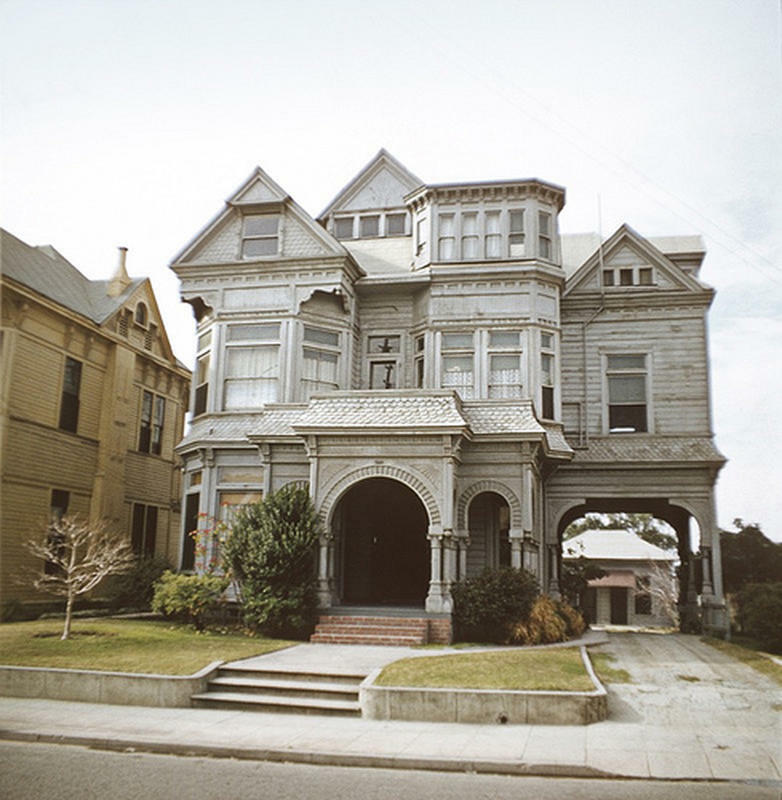 After the Great Depression, the grand old Victorian mansions were run-down and used as cheap apartment hotels, and the once thriving hilltop suburb became a symbol of urban decay that discouraged new investments. 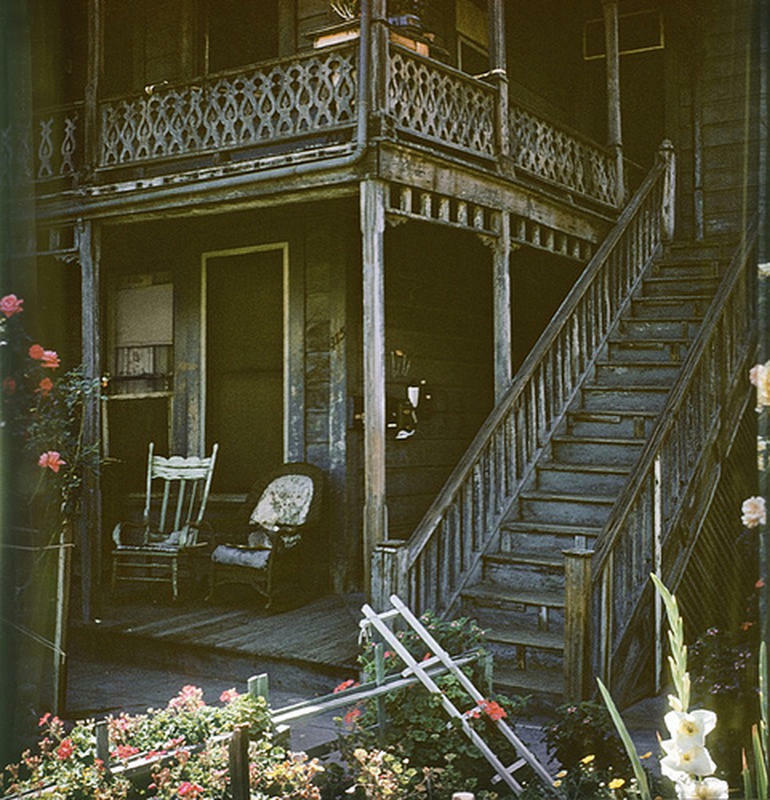 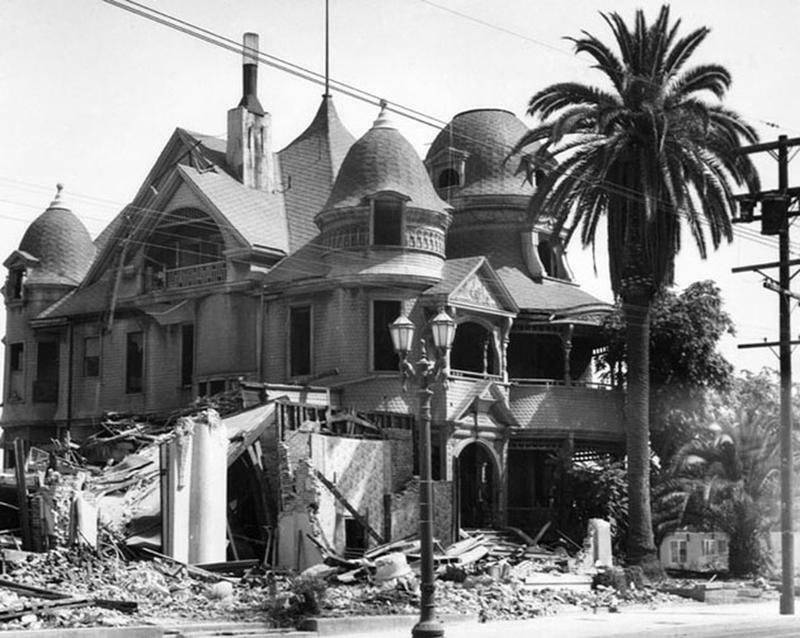 In the 1950s, the Los Angeles Community Redevelopment Agency came up with a redevelopment plan for the entire Bunker Hill area and by 1968, every last Victorian home of Bunker Hill Avenue had been demolished or relocated. 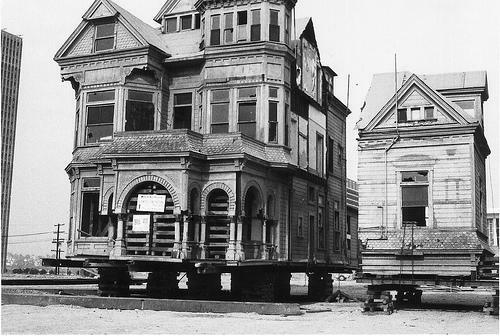 These pictures show the last surviving houses, the Castle and another Victorian home, the Salt Box, being relocated by preservationists to another site in the 1960s, only to end up getting torched by vandals soon after. 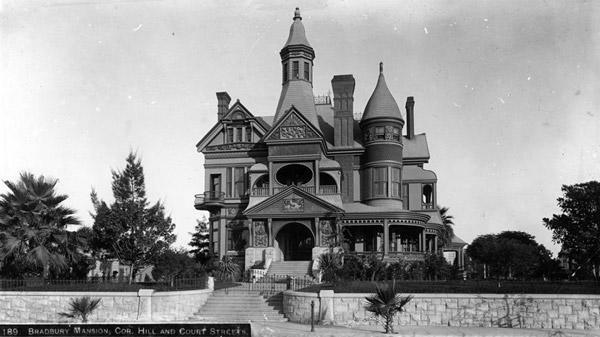 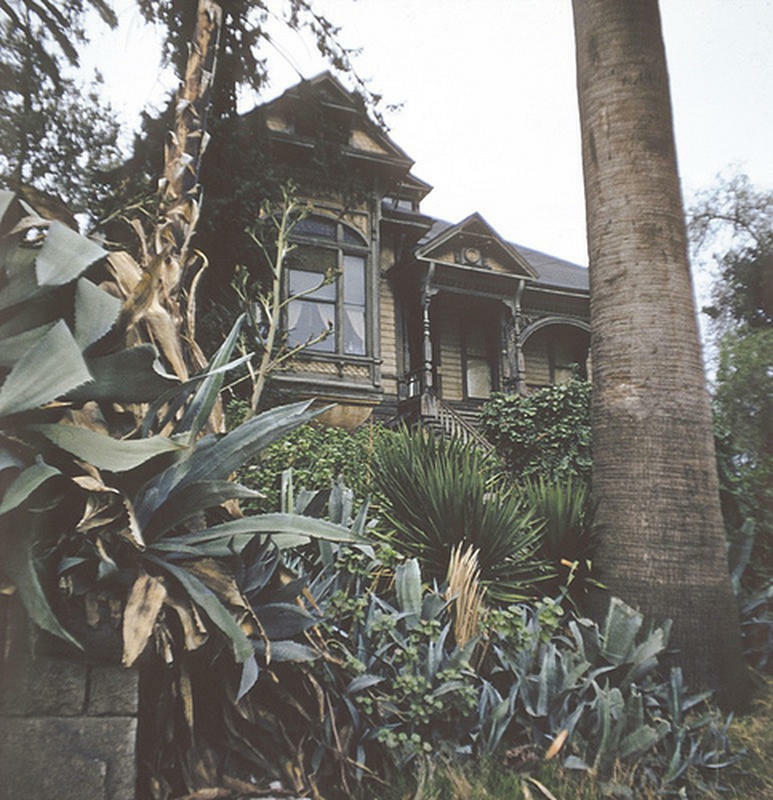 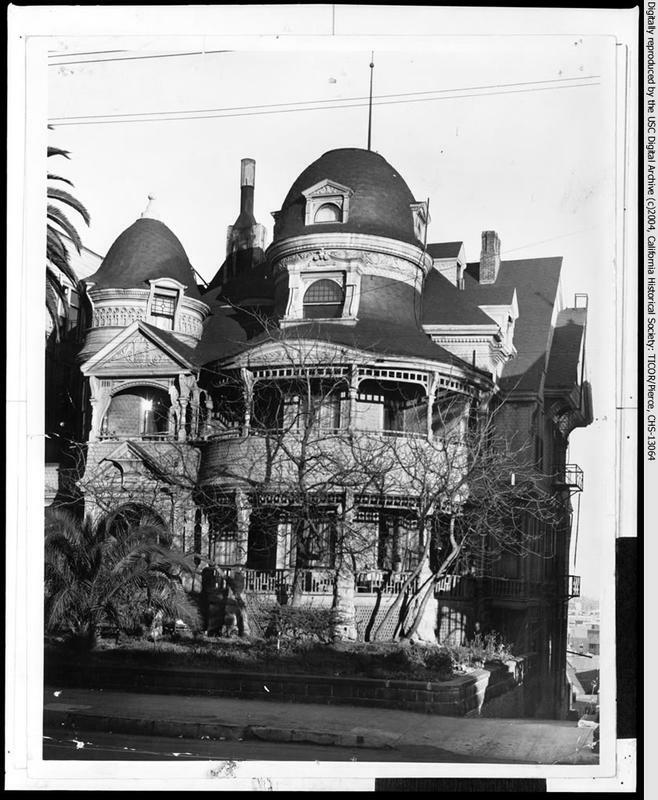 Affectionately knick-named “the Castle”, this elegant Victorian house was one of many in the once prestigious neighbourhood of Los Angeles, known as Bunker Hill. 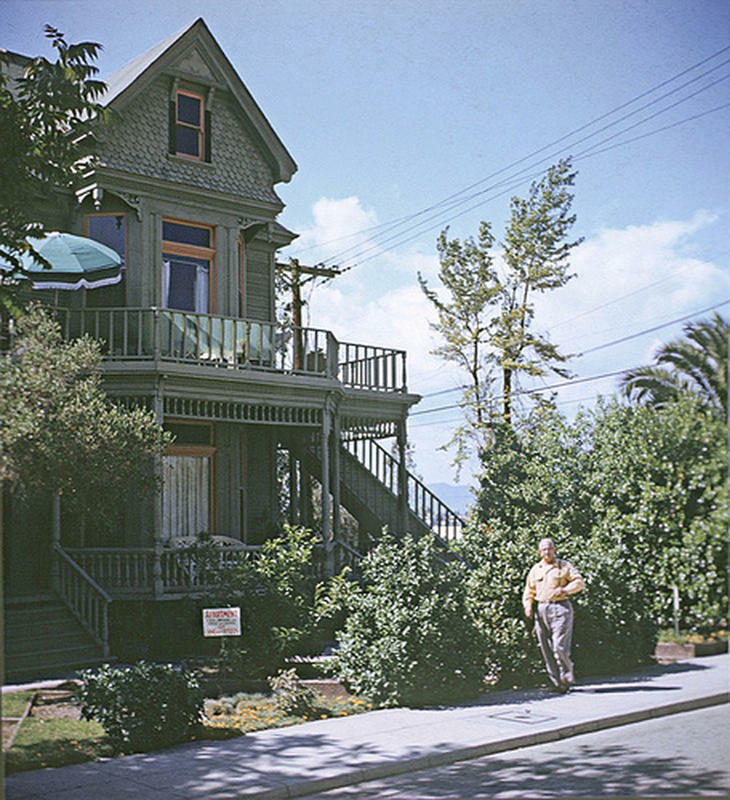 Photo by George Mann of the comedy dance team, Barto and Man, 1950s. 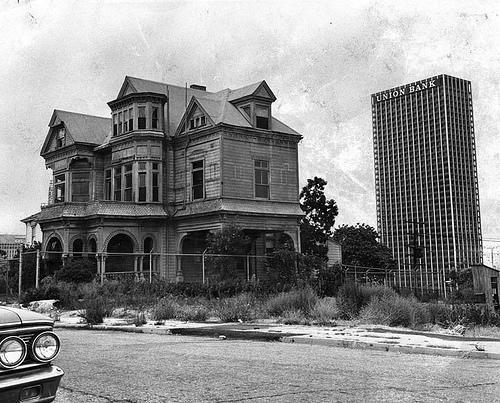 With the future looming in the background, the Castle is pictured above, fenced off, awaiting its fate. 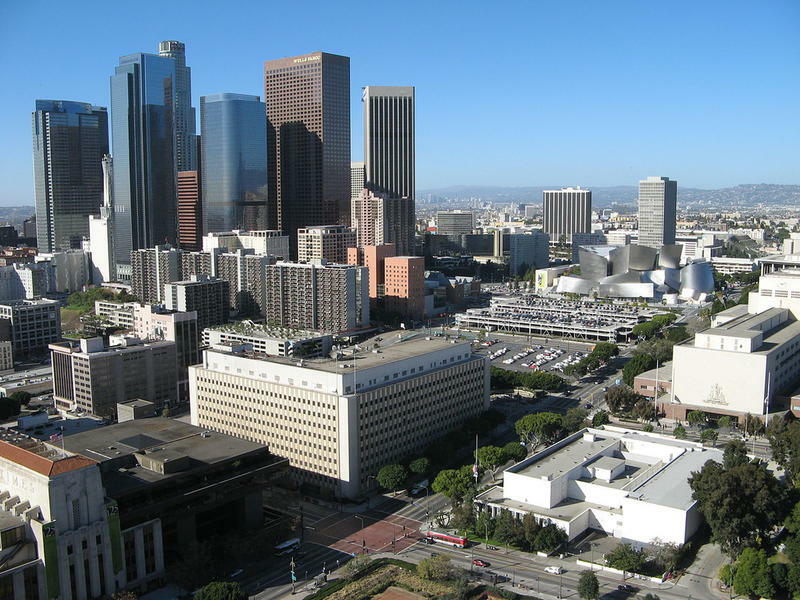 Behind is Downtown’s first skyscraper, the Union Bank Building. 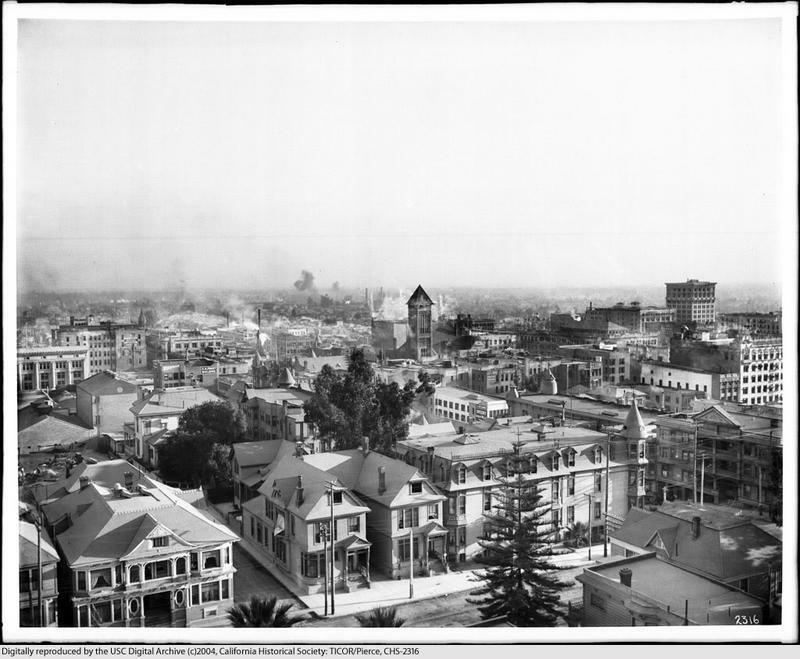 This is a picture of a Los Angeles that no longer exists. 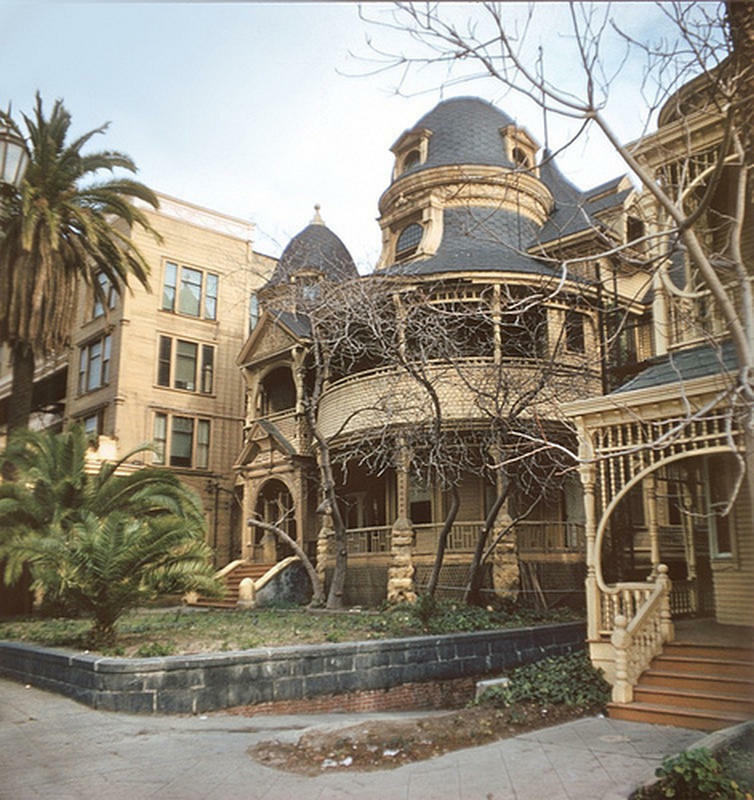 The controversial redevelopment destroyed and displaced a community of almost 22,000 working-class families who renting rooms in the architecturally significant but ill-maintained buildings. 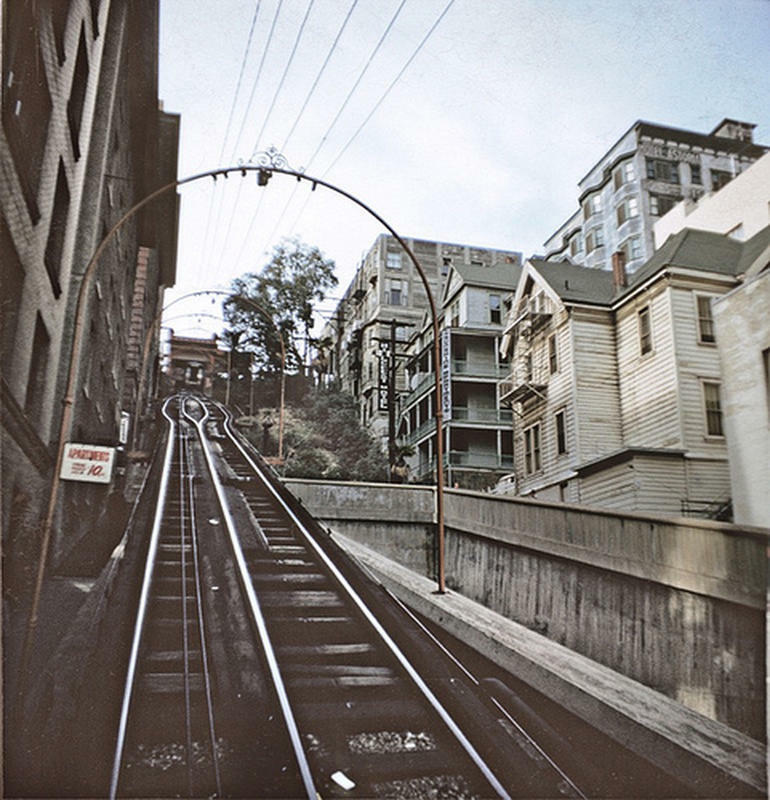 The original Angel’s Flight, a landmark funicular railway at Bunker Hill, once stood half a block north of where it stands today. 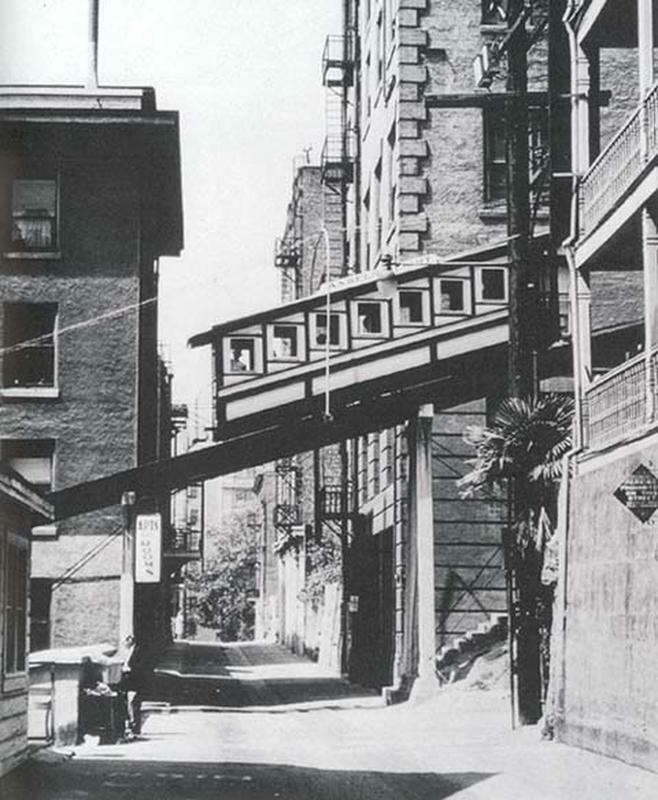 But in 1969, the railway was closed as the area underwent total redevelopment and all its components were placed in storage for nearly thirty years. 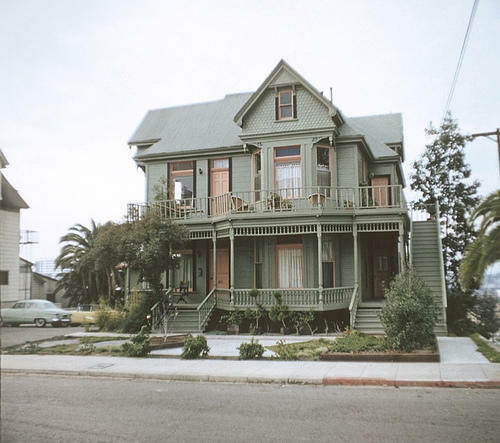 You can see here how it looked amidst its Victorian backdrop, looking almost European even. 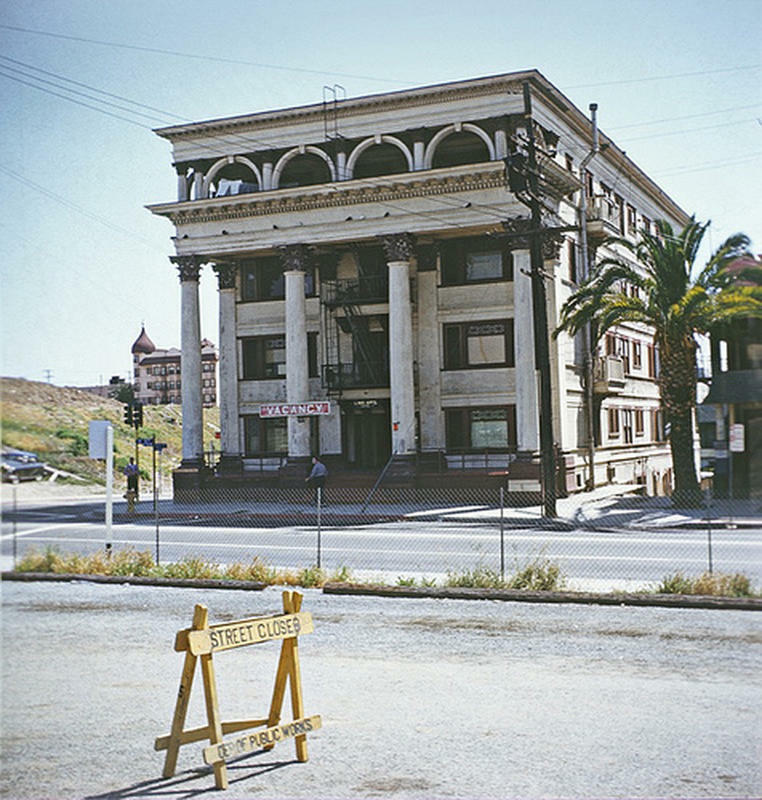 Pictured: The Lima apartments, an example of the residential ‘hotels’ of the early 20th century in Bunker Hill, formerly desirable apartment buildings before the area’s decline. 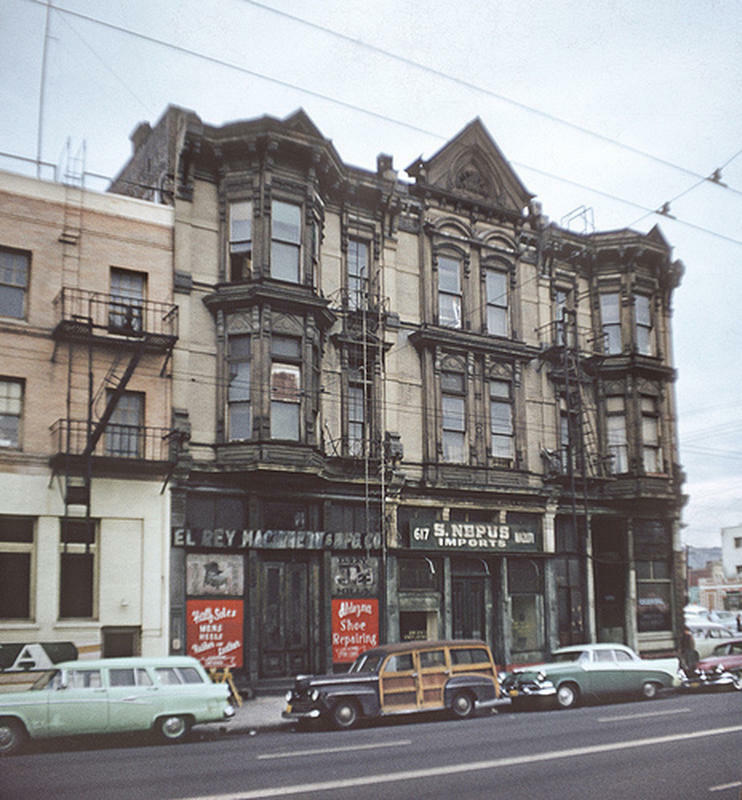 The Melrose Hotel, built in 1882 and Hotel Richelieu at Grand Avenue and Second Street in the late 1950s. 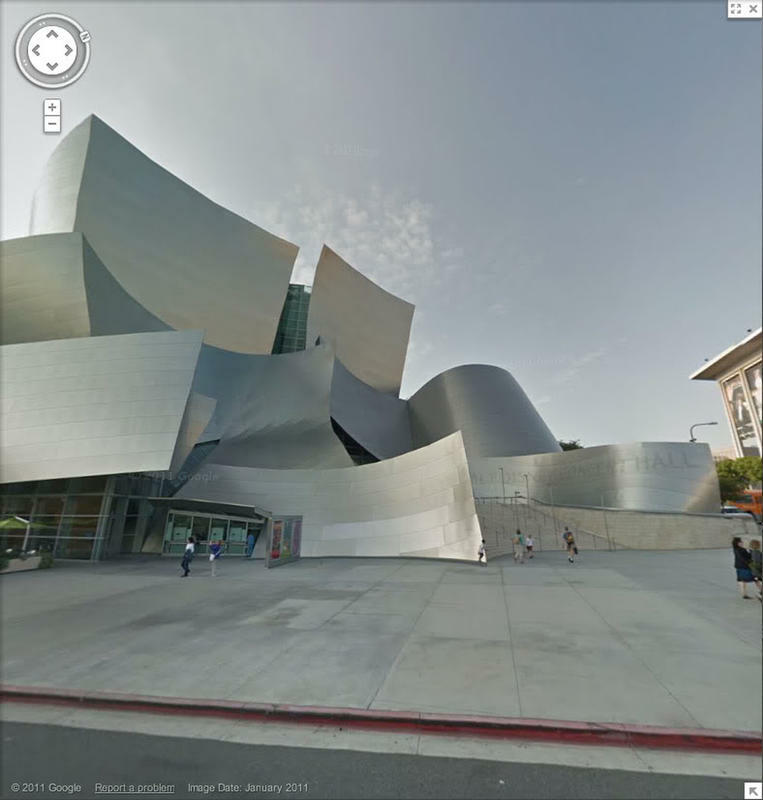 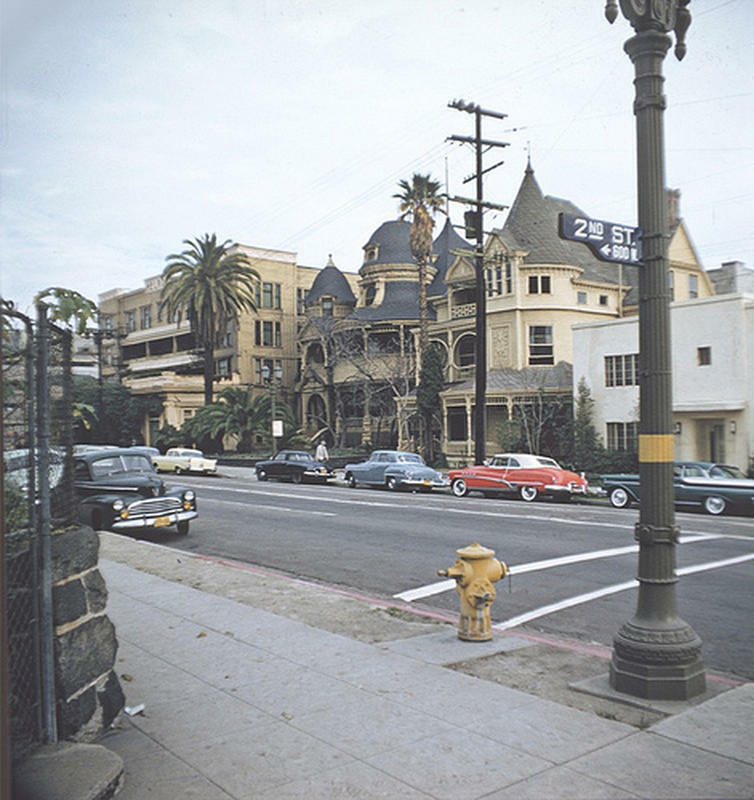 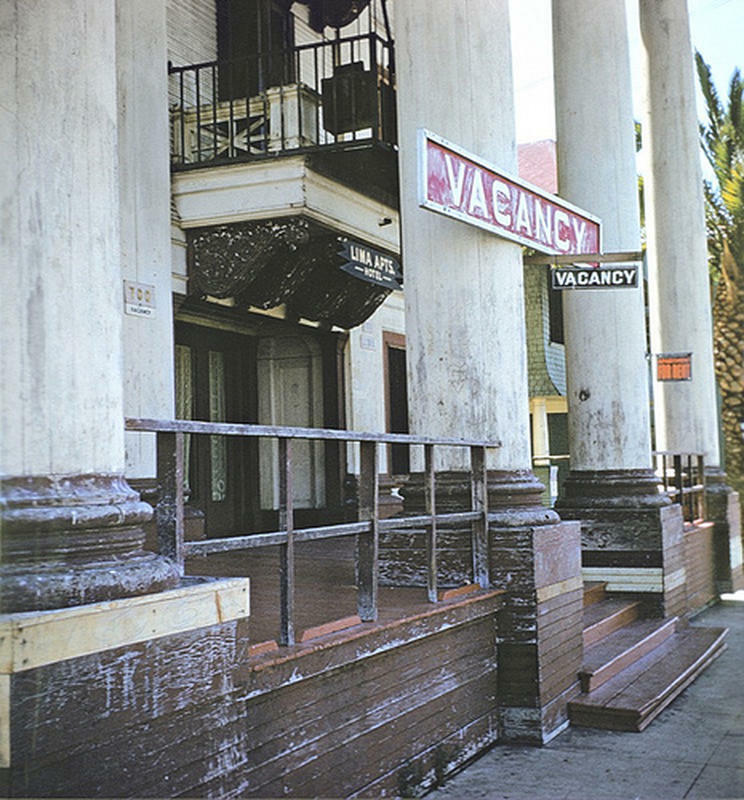 If you could stand on the front porch of the Melrose Hotel today, you’d be looking at this building across the street, the Disney concert hall. 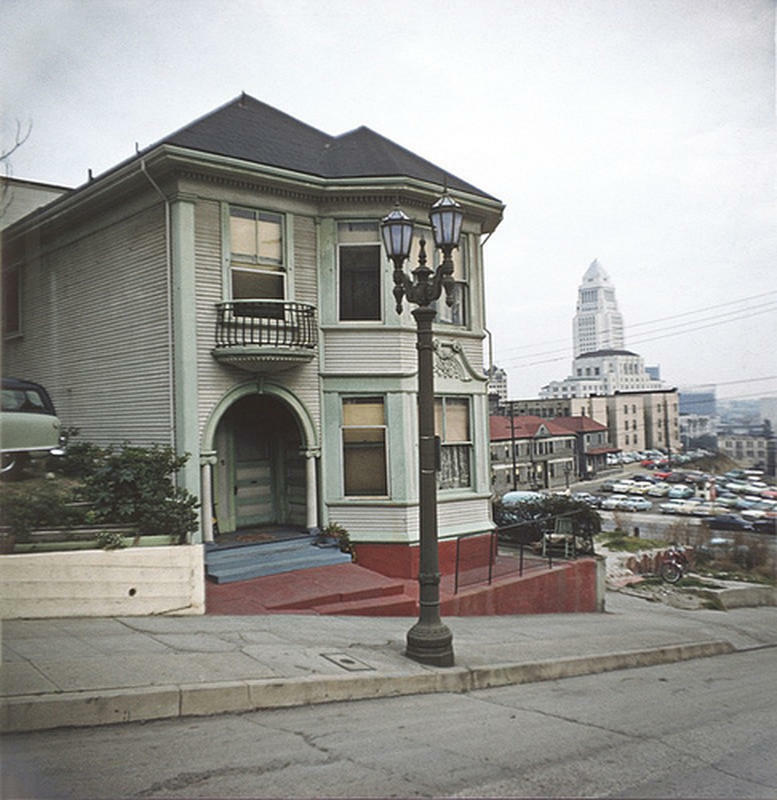 This is Bunker Hill today.